This past week we got a sad email from Hilary Craig that she lost her greyhound, Penfold, to cancer in early January. Hilary adopted Penfold from our group in September 2006 and she was broken hearted to lose him. He was seven years old. Hilary also adopted a female greyhound (Ezzie) from our group last year. We remember Penfold; he was such a handsome boy and very sweet natured. He got along well with Hilary’s cat (the one that didn’t usually like other animals!). 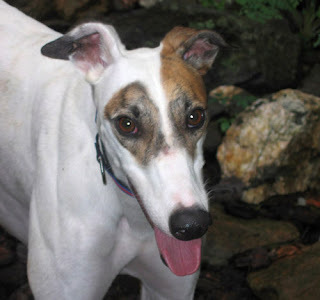 Hilary is contemplating adopting another greyhound and, if she does, we know that another hound will get a good home. We are always sad when one of the hounds we place passes on. But we know that each dog had the best home with loving adopters who gave them a chance to have a great life. Run free sweet boy; you were greatly loved.